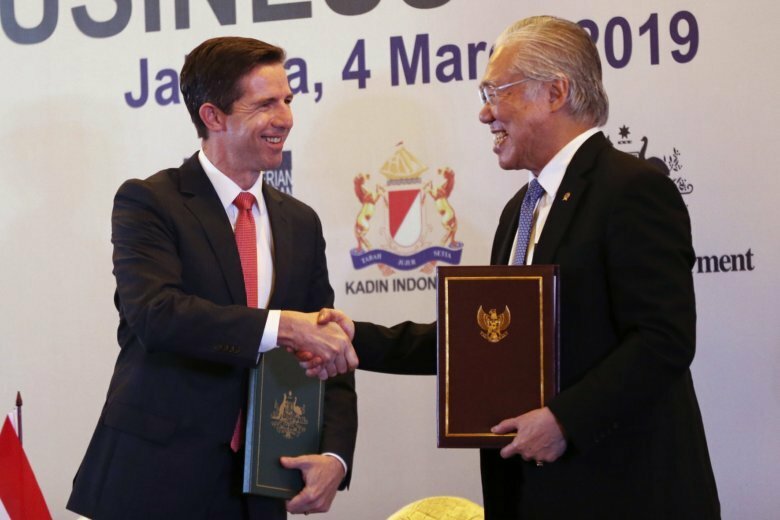 JAKARTA, Indonesia (AP) — Indonesia and Australia signed a free trade agreement Monday that will eliminate many tariffs, allow Australian-owned hospitals to operate in the giant Southeast Asian country and increase work visas for young Indonesians. Trade ministers from the two countries signed the agreement, negotiations for which first began in 2010, at a Jakarta hotel with Indonesian Vice President Jusuf Kalla looking on. It is subject to ratification in both countries. Indonesian Minister of Trade Enggartiasto Lukita said Indonesia would complete ratification by the end of this year. Annual trade between Australia and Indonesia in goods and services is valued at $11.6 billion. Though neighbors, their trade is relatively small, with Indonesia’s exports to Australia just 1.5 percent of its total exports. Indonesia, with 260 million people, is forecast to be one of the world’s biggest economies by 2030. Major details of the agreement were announced by Australia in September after leaders of the two countries said negotiations had been completed. The text of the agreement is expected to be released after the signing. Australia says 99 percent of its exports to Indonesia by value will be tariff-free or have improved preferential access by 2020, up from 85 percent under an existing trade agreement between Australia, New Zealand and 10 Southeast Asian countries. Indonesian exports to Australia will face no tariffs, but it already enjoys substantially tariff-free access to the Australian market under the Southeast Asia agreement. The Australia-Indonesia agreement will allow Australian companies to have majority ownership of investments in various industries in Indonesia, including health care, telecommunications, energy, mining and aged care. Separately, Indonesia is considering allowing foreign companies to invest in higher education, which along with hospitals is an area the country is lagging far behind international standards. Australia’s live cattle exports are set to increase under the agreement, with tariffs to be eliminated and the number of animals exported to Indonesia allowed to increase 4 percent a year until reaching 700,000. Australian working holiday visas for young Indonesians will be increased to 6,000 a year from the current 1,000 over six years.